The new GeeXLab is out with Bullet Physics support, improvements and bugfixes. And GeeXLab 0.25.0.0 is available for all platforms. The french version contains more information. I will update the english version during the next weeks, months... years! for Lua and Python. The Bullet Physics plugin is available on all platforms. + added create_cylinder_xyz() to gh_mesh lib (lua, python). + added list_clipping_begin() and list_clipping_end() to gh_imgui lib (lua, python). Perfect to handle very very large lists. + added mouse_set_position() to gh_input for all platforms.
! updated gh_input.mouse_show_cursor(): now available on all platforms. + added sound_get_open_state() and sound_spectrum_read_v2() to gh_audio lib (lua, python). and actor_get_linear_speed2() to gh_physx3 lib. that slowed down the plugin initialization by trying to read some CPU data. to gh_imagemagick lib (lua, python).
! updated ImGui / gh_imgui lib with latest version 1.62 WIP. + added mouse_get_position_v2() and mouse_set_position() to gh_input lib (lua, python). - disabled imgui_tabs functions (broken with latest ImGui 1.62). + [TINKER BOARD / RASPBERRY PI] added trilinear filtering for OpenGL ES renderer. * fixed a crash in gh_sqlite3.db_column_get_text() in the Python plugin. A bugfix + minor features release is available for Windows platforms. I will release GeeXLab for other platforms later. and actor_set_material() to gh_physx3 lib. and required_version_build attributes in the XML root node). * fixed a stupid crash in gh_imagemagick.file_exif_get_property(). A new bugfix / minor-features version of GeeXLab has been released for Windows platforms.
! updated ImageMagick plugin with auto-orientation of image at loading.
! [WINDOWS] updated the buffer size for the drag and drop operations. + added show_metrics_window() to gh_imgui lib (lua, python). GeeXLab 0.25.3.0 is available for all platforms. The Drag and Drop support has been added to GeeXLab for Linux, Raspberry Pi et Tinker Board (a video is available HERE that shows the drag and drop in action on Raspberry Pi). Tinker Board (GL ES version). + added is_any_window_hovered() to gh_imgui. now mouse button state params can be boolean or integer. + added db_get_version() to gh_sqlite3 lib (lua, python).
! updated SQlite3 engine to version 3.24.0. A new update of GeeXLab is available for Windows 64-bit platform only. GeeXLab 0.25.4.0 is a maintenance release and many libraries have been updated to their latest versions. The default demo (the one that is loaded when you start GeeXLab) has been updated with some buttons (web links) to make easier the first steps with GeeXLab.
! [WINDOWS] updated the launching demo (default demo).
! updated ImGui with latest version 1.63 WIP.
! updated NanoVG with latest version.
! [WINDOWS] updated Assimp plugin with latest SDK.
! 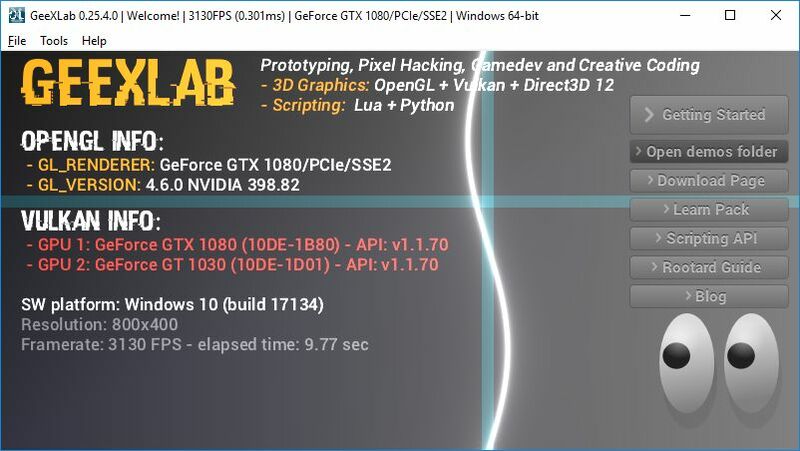 [WINDOWS] updated FBX plugin with latest SDK FBX_2019. to gh_utils lib (lua and python). + added get_vertex_absolute_normal() to gh_mesh lib (lua and python). any suggestion how to hack it ? Looks like you have an Intel GPU. Maybe an issue with one of the GeeXLab plugins. Try to rename the plugins/ folder (like _plugins/) in order to prevent plugins loading. Let me know.